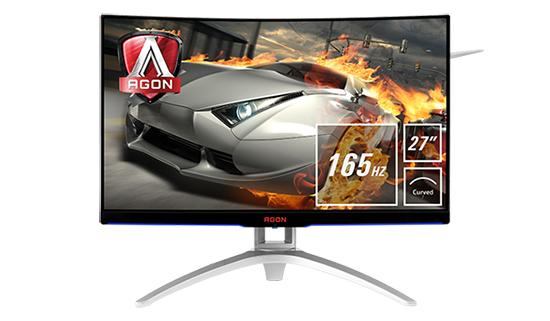 Display specialist AOC announces the AOC AGON AG272FCX6, an upgrade to its 68.6 cm (27”) curved Full HD gaming monitor AG272FCX. The newer AG272FCX6 has been revamped with a 165 Hz refresh rate instead of the 144 Hz of its predecessor and comes with a more affordable price tag. Gamers won’t have to compromise between a responsive display and a panel with exceptional image quality, as the monitor’s MVA panel boasts fast 1 ms response time as well as a 3000:1 contrast ratio and 178°/178° wide viewing angles. The eye-catching design of the AG272FCX6 with customisable RGB lights in the back takes as little space on the desk as possible, has an ergonomic stand with height adjustment and offers minimal bezel width for seamless multi-monitor setups. Its AMD FreeSync support practically eliminates stutter and screen tear, offering a smooth gaming experience, and helps increasing the immersion and the “connected feel” created by the monitor’s fast panel and 1800R curvature. The AOC AGON AG272FCX6 represents a whole new level of immersive gaming experience, especially for fans of MMORPG’s, Action and Racing or Sim games. The 27” MVA panel is built with a subtle curvature of 1800R, pulling gamers closer to the scene. The panel of the AG272FCX6 has a maximum refresh rate of 165 Hz, and when used with AMD FreeSync, the monitor adjusts its refresh rate, matching the GPU’s fluctuating frames per second in games and eliminating screen tear. The very low input lag lets gamers receive visual feedback without any noticeable latency. With the native Full HD resolution, gamers can squeeze the most out of the high refresh rate. At 165 Hz and with 1 ms response time, the effect of motion blur is perceivably reduced, movement feels more natural, the edges seem crisper, and choppiness of gameplay is practically gone. Also, the 3000:1 contrast ratio of the MVA panel mesmerises with deep blacks, vivid colours and coverage of 100% of the sRGB colour gamut. As the AG272FCX6 aims at gamers who enjoy customising their battle stations with unique PC cases in various sizes and shapes and RGB-coloured peripherals, the monitor comes with red, green and blue LEDs on its back side with wing shaped accents and three intensity levels. The customisation continues with the fully ergonomic stand, offering 110 mm height adjustment besides tilt and swivel. The QuickSwitch wired controller included in the box offers quick access to the AOC Game Modes (for FPS, Racing or RTS, and three customisable presets) without fiddling with the OSD, using the 5-way joystick on the bottom of the display. The carrying handle and cable management built into the design of the stand allow easy transportation and create a cleaner desk without visible clutter. Using the AG272FCX6’s AOC Shadow Control feature, gamers can highlight shadowy-dark areas to better see details without affecting the rest of the image, or darken bright areas, too. Also, to allow gamers to play comfortably for long hours, AOC FlickerFree technology eliminates flicker and the Low Blue Light mode reduces blue light, reducing eye discomfort and fatigue. AG272FCX6’s 2x HDMI ports, 1x DisplayPort and 1x VGA input as well as 2x USB 3.0 ports allows multiple sources to be connected. The audio can either be streamed through the AG272FCX6’s stereo speakers (2x 3W) or routed through the line-out/headphones port on the back. The AOC AGON AG272FCX6 will be available in April 2019 for €349 / £299.